Click any button above to view documentation for ProKeyGen EZ. With ProKeyGen EZ you can easily generate large customizable collections of unique 25-character Product Keys / Serial Numbers for use with your own products. With the click of a button, save all your keys into a text file that can be used as the basis for the Product Key listing required by vendors, brokers or resellers of your products. 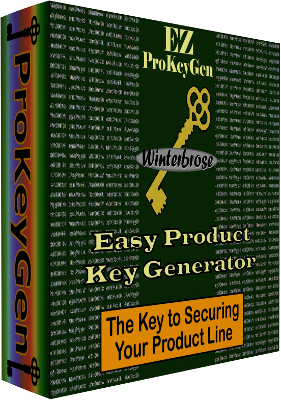 EZ ProKeyGen is to be used solely for creating Product Keys for your own personal and commercial products. ProKeyGen EZ is not designed or intended to create unauthorized/illegal keys or serial numbers for applications/products available from other software companies. Upon registration, you are issued a unique activation code for your sole use of EZ ProKeyGen. When first run, ProKeyGen EZ prompts you for this key. By activating this product, you confirm that the key used to activate this product was issued directly to them by Winterbrose or an Authorized distributor. Activation of this product signifies full acceptance by the User of all licensing agreements, update notifications and product announcements. 1. Enter the desired serial number range to use. 2. Enter your own unique Encryption string. 3. Click the Generate Keys button and wait. 4. Review the generated list of Product Keys. 5. Click the Save button to save text file of list. Before uploading a list of Product Keys that was saved with ProKeyGen EZ, before sure to remove all of the header information that is included for your benefit. Most brokers/resellers expect the listing to be provided as a plain text file with only one product key per line. Simply delete the seven lines (from top to last row of equal signs) and save the file with a new filename in format needed to be used by your broker/reseller. Since EZ ProKeyGen saves the product key list as a plain text file, this is all you have to do. You will want to retain a copy of your original file because it contains your unique Encryption String. If a broker/reseller expects a comma separated listing, use any compatible text editor or word processor to replace all paragraph characters/end of line markers with the comma “,” character. 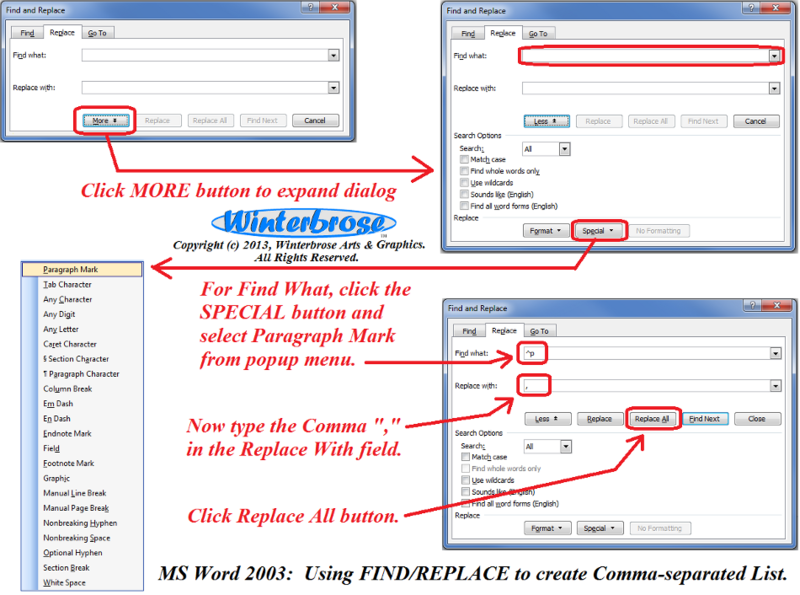 Here is the Microsoft WORD demonstration for inserting comma separators. 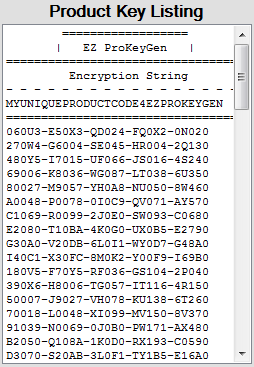 The actual number of product keys created using ProKeyGen EZ is dependent on the Encryption String you use, however the number of possible unique keys using ProKeyGen EZ can be calculated as shown below. Well, you get the idea. Don’t burn out your calculator trying to get the final result. We hope you find ProKeyGen EZ to be a value-added part of your software toolbox. Estimated values based upon default allowed alpha-numeric character set and characters within key string derived from encryption algorithms. 1. Enter the desired serial number range to use. Totally up to you. 2. Enter your own unique Encryption string. It is suggested to use a different Encryption String for each Vendor/Broker/Distributor. It will be included with the list of product keys when you save them. 3. Click the Generate Keys button and wait. The Progress Bar will display the percentage of completion and the Number Keys will display the counter for which actual key as positioned in the list is being generated. If for some reason you cannot wait or wish to cancel the process, simply click on the ABORT button. 5. Click the Save button to save text file of list. Be sure to name your file in a way that works for your business (see sample listing on next page). 2. Generate specific ranges of keys for designated Vendors; this way you can issue a set number of keys (say 1,000) at a time to different vendors. 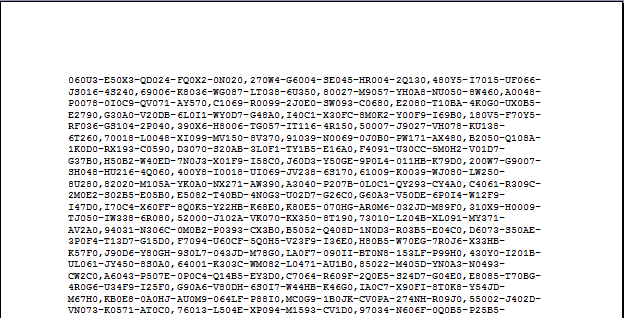 For example, you generate the first 1,000 keys (0-999) for use by Vendor X and the second 1,000 keys (1000-1999).